After several jam-packed weeks of sight-seeing, exploring, and studying, I finally feel settled, ready to reflect on my initial weeks here in Amman, Jordan. This being my first time in Jordan, my expectations were strongly influenced by what I heard from other students who had participated in the program last year, accentuated by the few history and travel books I managed to skim a couple days prior to leaving. Therefore, I was looking forward to my first full day in Amman, when I would finally be able to experience Jordan with my own eyes, rather than through the stories of others. We started off the day with a brief orientation at the Grand Hyatt Hotel, then headed off to وسط البلد, a bustling area of Amman that overwhelmed the senses as we strolled past restaurants, clothing shops, and an outdoor market teeming with locals interested in purchasing their produce for the week. After enjoying a refreshing fruit cocktail, composed of blended tropical fruits and topped with peanuts, our guide took us to a landmark that took my breath away. 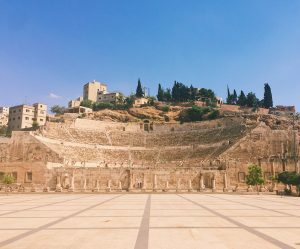 Located in the middle of Hashemite Plaza is the Roman Theater, an impressive restoration of the original theater built during the reign of Antoninus Pius (AD 138-61). Towering above my head, the glare of the sun made it difficult get a glimpse of the top. Nevertheless, I followed my peers as we struggled to climb the slippery, steep steps, anticipating the remarkable view of Amman that awaited us. Beads of sweat dotted my forehead as I took one last step and arrived at the apex of the theater. Turning around, a magnificent view of Amman welcomed me. I admired the aesthetic view that the limestone and sandstone buildings provided, observed the signature yellow taxis driving chaotically through the street, and made out an eager owner selling intricate abayas to a few women. 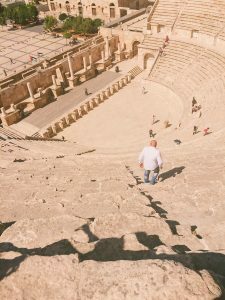 I marveled at the fact that I was standing on Roman ruins, a link to Jordan’s past that is still relevant today, as it is used as a venue for cultural activities and concerts. 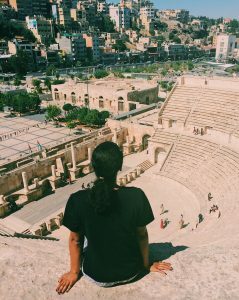 I doubt many of my friends and family would guess that I would visit Roman ruins in the Middle East, a spectacle associated with a sophisticated vacation to Italy, not a study abroad trip to Jordan. This theater is a remnant of Roman conquest and rule in Jordan, which stands in defiance of my preconceived expectations. It is also a powerful reminder of why I am here. This summer is a chance to learn about Jordan’s history, culture, and people, in an immersive way that cannot be experienced back in America. This opportunity will not be seamless; in fact, I’ve already felt exasperated by the cultural differences between me and my host family, I miss my mother’s Asian-inspired cooking, and only two weeks ago, I was stranded in the middle of the Jordanian countryside with only camels available for transportation (trust me, it’s a long story). But throughout these difficulties, I’m slowly but surely gaining more knowledge and awareness regarding Arabic and Jordanian culture. By August 17th, I know that I won’t want to leave. 1 Comment to "Relic of the Past, Reminder for the Future"
You’re awesome, enjoy the adventure and keep helping us see it through your eyes!